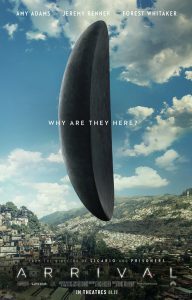 With the release of Denis Villeneuve’s science fiction feature film, Arrival, Kyle Willoughby and Claire White take the opportunity to dive back into The Big Book of Science Fiction. Kyle talks about the first alien ‘encounter’, when the Conquistadors met the Aztecs, and how the Sapir-Whorf Hypothesis is key to understanding the film. Claire traces the film’s trajectory from a short story written by Ted Chiang, to a screenplay no production company would touch, to the record setting price Paramount paid for it’s distribution rights. The hosts close with their thoughts on the short story, the film, and why it’s exciting that it got made.